Shontayne Hape can turn the tables on recent England cross-code misfits and be a hit in Test rugby union, says his former Bradford team-mate Robbie Paul. Bath's dual-code centre, who off the pitch is an accomplished DJ, is one of the new faces in England's elite squad. But while many converts have failed in union, Paul believes Hape can give his adopted country a "creative spark". Paul told BBC Sport: "He's got A, B, C and D. He's a joy to play with, a creator who plays attractive rugby." The inclusion of Auckland-born Hape, who won 14 caps for New Zealand in rugby league, raised eyebrows in some quarters when England manager Martin Johnson named his revised elite squad on Wednesday for the Six Nations. Hape, who qualified for England on residency grounds this month, won everything bar the World Cup in league, but union fans could be forgiven for not pinning all their hopes on the latest recruit to make the transition to the 15-man code. I've got five or six of his mixes on my iPod. I can see him in Ibiza! Barring the notable exception of Jason Robinson, who Paul describes as a "freak of nature", the list of former league players to have found the road to union to be filled with potholes is long. Chev Walker and Karl Pryce both lasted less than a year in the 15-man code, while Paul's brother Henry (six caps for England), Andy Farrell (eight) and Lesley Vainikolo (five) all failed to do justice to their considerable talents. Hape himself described the transition as "like playing squash or badminton and then trying to play tennis". But the 28-year-old has been slowly nurtured by a patient Bath head coach Steve Meehan since arriving at The Rec in the summer of 2008 and, after only 33 first-team games, is now within sight of a first England cap. "Bath have dealt perfectly with Shontayne," said Paul, a childhood friend of the centre, both hailing from the same Te Atatu club in Auckland's western suburbs. "I've seen some rugby league converts looking like a fish out of water, but Bath have taught him the skills and aligned that with his natural ability. "By forcing Shontayne to play with the second team and then gradually work his way into the first team, Bath made sure he uses his skills in an environment he's comfortable with." Those 'fish out of water' include Paul's brother, Henry, who was called into the England squad just five days after his debut for Gloucester, and Vainikolo, who was catapulted into the England team after only nine games in union, the first a five-try outing on his debut. "With Henry and Lesley, within a few games they were in the international set-up without having been taught the basics," noted Paul. "I believe you should earn your right to play for a team." Asked to assess the attributes the 6ft 2in, 16st 5lb Hape will bring to the England party, Paul's answer is so comprehensive there could be enough time to put down the phone, make a cup of tea and still be back before the end of his response. "He has balance, strength, is very quick for a guy his size, has the ability to shake a tackle and can step off both feet," enthuses the New Zealander, who currently plays part-time for Leigh Centurions. "He has very big hands, so he's able to just hold off one tackle and pass with the other. "He's got great defence, so you'll rarely see him get beaten on the outside, and he's selfless. Even if he's in space, if he sees someone on the outside in a better position then he'll put them through for the try. "When we used to play together, I'd just say 'let put this play on' and I knew I could trust him, he had a fearlessness about him. "He was a revelation at the Bulls, a big part of the success we had and a lot of Lesley Vainikolo's success was down to Shontayne Hape." Hape has mainly graced the Recreation Ground as an inside centre, but there is talk that he could be deployed as an outside centre for his adopted country, with compatriot Riki Flutey a strong contender to regain the 12 jersey after injury. Paul, who played for Bradford, Huddersfield and Salford in Super League, is confident his former team-mate would succeed in either position, and brushes aside concerns that three knee reconstructions, two of them on the right, will impede Hape at the highest level. Off the pitch, the laid-back Hape can also be expected to bring a certain exuberance to the England squad. During his five years at Bradford, the centre - influenced by rap artists such as Jay-Z and Kanye West - would transform into his alter ego DJ Shape and mix some tunes at local bars. It is a passion the father-of-one has enjoyed since he was a teenager, and last month he held a gig in Bath to raise funds for victims of the tsunami that hit Samoa in October. "He's really good," says Paul, who is in his second year of a sports marketing degree at Huddersfield University. "I've got five or six of his mixes on my iPod. I can see him in Ibiza!" Paul's pride in Hape's success is clear and understandable. He likens him to a younger brother and describes their families as "inseparable" while they were growing up. The 33-year-old has seen at close hand Hape's development from a promising youngster to a rugby league great - in 2007 Hape was named in Bradford's team of the century - and Paul has had a significant influence on his career. 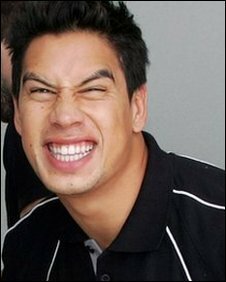 He encouraged the Bulls to sign Hape back in 2003, initially welcoming him into his home, before helping Hape and his wife Liana, a dancer, find a house on the outskirts of Bradford. Hape and his wife, who has danced with pop stars such as Shaggy, Pink and Natalie Imbruglia, are both well-known in their native New Zealand, with the couple's wedding being covered by a national magazine. So, how will Hape's defection be welcomed back home? "His name will probably be mud in New Zealand!" says Paul half-jokingly. "But when I was younger I just wanted New Zealanders to do well on the international stage because we're such a small country. The fact that an athlete can perform at a national level is great."